No, I haven't yet read it, but I'm adding it to my wish list. From what I understand, author James Wallman coined the catchy term "stuffocation" to describe the oppressive sensation a First-World occupant feels when overcome with too much stuff. This is the very sensation that I believe folks who are editing their belongings and choosing to live in small houses (like many of the homeowners featured in my upcoming book The New Small House) are aiming to avoid. Apparently, Wallman advocates less for simple living and more for experiential living. I, however, suspect that the simple living -- that inhabiting a well-designed small-house affords -- enables more experiential living. Admittedly, having not yet read Stuffocation, I don't know what type of experiences Wallman is promoting; I guess I'll just have to read the book to find out. In any case, the word "stuffocation" itself is enough to capture my interest. It's not quite as fun a word as Stephen Colbert's "truthiness", but it may be as timely. I think I should probably change the name of this category to "Reading wish list", since, once again, I'm going to comment on a book I haven't yet held or read. I was late to learn of Royal Barry Wills, a New England architect who launched his practice in 1925 and went on to win the National Gold Medal for a small-house design in Herbert Hoover's 1932 National Better Homes Competition. In his heyday, Wills penned several well-received books including Houses for Good Living, Better Houses for Budgeteers, and Living on the Level: One-Story Houses,among others. He was perhaps best known for his Cape-style house designs which were 1920's, 30's, and 40's interpretations of the traditional Cape Cod cottage. As architecture approached the mid-century modernist era, Royal Barry Wills's modest, straightforward, highly livable, traditionally-inspired residential designs were not in vogue with the architectural establishment but were beloved by the middle and upper-middle class homeowners who commissioned them or dreamed of commissioning them. While reading up on Royal Barry Wills, I was delighted to discover that Wills was a friend of Samuel Chamberlain (previously mentioned in House Enthusiasthere), another champion of the Cape Cod cottage. Chamberlain is quoted on the Royal Barry Wills Associates, Inc. website as writing in 1937, "'No sham or pretense gives a false note to the true Cape Cod cottage. They are genuine, honest and sedate. They have no need to assert themselves like newcomers anxious to im­press, for they have been a part of the American scene for centuries. Decidedly, they are not a pass­ing mood of the moment, despite their current popularity.'" The same could perhaps be said of the Cape-style house in the 21st century. And, indeed, the firm, now helmed by sole principal Richard Wills (son of Royal Barry Wills), appears to continue reinterpreting the Cape Cod cottage, as well as other traditional house forms, for contemporary living. I understand that it's these newer homes, from the past decade, which mostly populate At Home in New England: Royal Barry Wills Architects 1925 to Present. But, admittedly, my interest will turn more to the homes designed by the firm's founder. 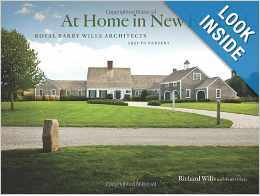 Nonetheless, it sounds like a monograph sure to capture the interest of New England house enthusiasts. It's certainly on my wish list. I was going to write about several widely distributed, somewhat recently released, house books, so that you might add them to your holiday gift list. I was thinking of highlighting Deborah Needleman's The Perfectly Imperfect Home and Diane Keaton's House -- both pleasant diversions, but instead, I want to share with you a small-press offering: House and Home, an OrangeArt Miniature. It's a tiny 3-1/4" x 4-1/2" letterpress original by Darrell & Elisabeth Hyder of The Sun Hill Press. It's full of sunny and/or pithy house-related quotations and intermittent tiny sketches, all bound between faded-blue, house-plan end papers. Within its pages find insight like Frank Lloyd Wright's "No house should ever be on any hill or on anything. It should be of the hill, belonging to it, so hill and house could live together each the happier for the other." And quips like Joan Didion's, "You have to pick the places you don't walk away from." 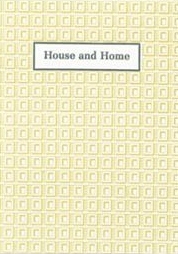 And heart felt sentiment like Mark Twain's, "[Our house] had a heart, and a soul...we were in its confidence, and lived in its grace..."
Pick up a copy, where OrangeArt Miniature's are distributed, to savor the rest of House and Home's wisdom. cover image courtesy of amazon.com.Here I go again, commenting on a book I’ve neither held nor read. I have, however, read its inspiration. Like New England Icons by Bruce Irving, which is based on articles written by the book’s author, Cabin: Two Brothers, a Dream, and Five Acres in Maine by Lou Ureneck took inspiration from the author’s blog "From the Ground Up" on The New York Times website. There, Ureneck wrote, for example, about the intrinsic charm of his cabin’s structure: “For me, a timber frame is poetry made manifest in wood. I love the way the timbers fit together, tenon inside mortise, to make a snug joint; and I love the way the structure stands against the sky, shoulders squared and strong enough to shelter those who dwell inside it for centuries.” So, if you followed the blog, even intermittently, you, too, have some sense of Cabin. “From the Ground Up” caught my attention in late 2008 initially because my book concept Small Retreats, Backyard and Beyond had been “killed” by its intended publisher a few months earlier. I, like Ureneck, imagined many folks could appreciate the simple pleasure of a small place of one’s own, especially when times are tough. I may have even sent a link to Ureneck’s blog to my former publisher in hopes of bolstering my case that there was in fact an audience for writing about small retreats. Now, Ureneck’s memoir -- about the restorative powers of building a cabin and, in the process, building relationships and peace of mind -- has found its way to the shelves. For further insight into the book, check out the WBUR Radio Boston podcast of their recent Ureneck interview about his 640 square-foot, timber-frame cabin built with his brother in Stoneham, Maine. I’ve added Cabin to my wish list. Have you?